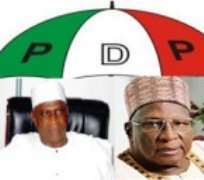 We have read some of the utterances of the Alhaji Bamanga Tukur-led faction of the Peoples Democratic Party (PDP) and found most of them to be exasperating, disgusting, unacceptable and very unfortunate. We have heard about the threat to suspend or expel State Governors and members of the National Assembly that are identifying with the true leadership of PDP under Alh Abubakar Kawu Baraje. We have also heard them abusing former Vice President Atiku Abubakar and calling him an ingrate just because he has decided to identify with our campaign for justice in the PDP of which he was a leading founding father and was instrumental to the payment of both the staff salaries of those working at the National Headquarters of the party and paid the rent for the National Secretariat in which some of these funny elements are currently operating from for three good years! To this group Governor Amaechi is a traitor for standing firm to his rights and likewise most of our people that have stick their heads to restore the party to the path of honour and democratic tenants. We consider some these of statements unbecoming of a leader of Alh. Tukur's stature as we pray that he will found time to purge himself of some of these undemocratic postures that is tearing the great umbrella apart. By these acts, Alhaji Tukur has demonstrated that he is intolerant, undemocratic and incapable of leading a democratic party like PDP. We urge him and members of his cabinet to stop making inflammatory statements capable of derailing the efforts of the Elders Committee of the party under the leadership of His Excellency Chief Olusegun Obasanjo GCFR to restore normalcy and unity amongst PDP members. He and his co-travellers should give some respect to members of the Elders Committee comprising eminent personalities such as former President Ibrahim Babangida, the BOT Chairman, Chief Tony Aninh and former National Chairmen of the party, among them Alhaji Ahmadu Ali and Dr. Barnabas Gemade. This is necessary so as to allow peace to be restored to our great party. We also find unfortunate Alhaji Tukur's allegation that Gov. Chibuike Rotimi Amaechi of Rivers State is sponsoring the activities of the opposition All Progressives Congress (APC). This is yet another reckless statement. If we may ask, on what basis would Gov Amaechi be sponsoring the activities of APC? Is he a member of APC? Are there not enough State Governors in APC to sponsor its activities so that Gov Amaechi, whose preoccupation is the development of Rivers State, would have to sponsor the party? Elders like Alhaji Tukur should refrain from making statements that are not only false but also capable of overheating the polity and creating more troubles for President Goodluck Ebele Jonathan and allow Mr. President to find ways to wrangle himself out of the myriad of problems so far created by some misguided elements surrounding him. Though we know that most of the actors and members of Tukur's NWC are not among the founding fathers of PDP which perhaps explains the strange way they have been running the party. We will like to put it on record that we the patriotic members of PDP will not be either intimidated or harassed out of the party as we are on a mission not only to rediscover the PDP but also to imbibe in the members the vision of the founding fathers of the party and restore internal democracy in the party. To us, that dinner was organised to give credibility to the charade that was called PDP Special National Convention. As a serious group, we cannot be a party to such squandermania while Nigerian masses are wallowing in abject poverty and our children kept at home instead of being in school because the Federal Government could not meet ASUU's demands. We wish to have nothing to do with such wasting of public funds and such trivialities associated with Alhaji Tukur and his leadership - which explains why he must be kicked out of the National Secretariat of the party. We cannot be a party to such a gathering while the PDP family is facing serious crisis that if not checked would dim the party's chances of winning future elections. This is a sign of a man chasing a rat while his house is on fire. Finally, we wish to advise those trivializing President Jonathan contesting or not contesting the 2015 election with threats and acting in such a manner as if only the Ijaws are capable of voting him or another person as the President of Nigeria in a country of over 300 tribes, to think wisely. In this regard, we commend and congratulate the thousands of Bayelsa people who have wisely decided to team up with the PDP under the chairmanship of Alhaji Abubakar Baraje to salvage our party from imminent disintegration under Alhaji Tukur. We assure these great minds that they will be fully protected under our umbrella.